I found it!! I had stored away this Stampin Up set from waaayyyy back, but it's one of my favorite Halloween sets -- "Halloween Hedgehogs". This particular stamp is so much fun to color and to use on a card -- it says it all!!! I used my Copics to color. The old fence and tree images are from a more recent SU set - "Home is Where the Haunt is" -- and I embossed this image using black ep (thank you, Susan, for this suggestion). The little candy corns and stars in the sky are also from the Hedgehogs set colored with Copics. I punched the moon out using a CM punch. I accented the images and the punched out moon in Spica glitter pens in complementary colors. This is one of my favorite cards so far this Halloween season. Look for more in coming posts. Thank you for stopping by! I visited Sherrie at our neighborhood store (Scrapper's Boutique) yesterday and picked out this little stamp from some new ones she got in .... I'm so glad I went by as these seem to fly out the door before I even know they're there!! I'm on vacation this week, so, had I been working, I'm sure this cutie would have gone they way so many more have done -- GONE!! I colored this with my Copics (thank you Jen for the lessons) and mounted it on black cardstock. 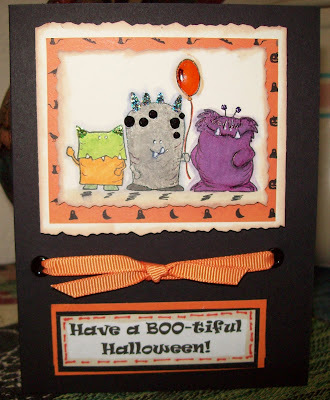 The sentiment "Have a BOO-tiful Halloween" I did on my computer and backed it with black and orange cardstock. they may not show up well in the photo, but I put in black eyelets to run the ribbon thru. I just LOVE this little card and know my grandkids will like it too. 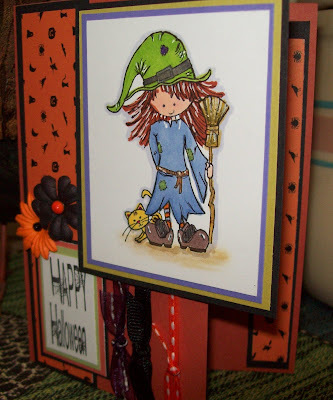 Here's another little witch card. I had an image in my mind about doing some "scribbles" with the colors that I used on the card -- gray, orange, black, light purple. That's what the background is in the middle of the card. I offset the little witch image (colored with Copics) and put a tag accented with Primas at the top corner. I added a black/white check ribbon to the orange ribbon in the bottom part of the card. I hope you enjoy it! Come back and see me again! 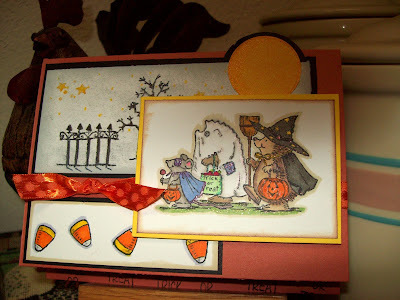 One of my most favorite times of the year to make cards (other than Christmas, of course) is HALLOWEEN!! .... and that time is fast coming upon us. 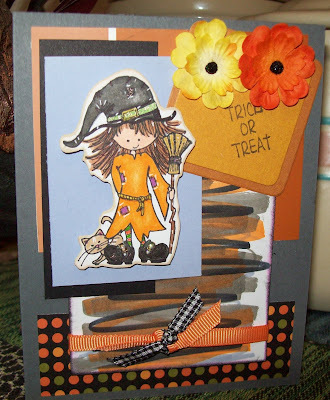 I just adore this little witch from Stampingbella and had to make my first Halloween card using it. The decorative paper is some left over from about 3 years ago and goes so well with anything and everything Halloween! The sentiment stamp is from Michael's $1 bin from a couple of years ago. I love being able to use all the stamps, papers, and ribbon that I already have. I hope you like the card and there will be more posts to follow as I have six grandkids to make them for. Thank you for stopping by yet again on these many posts. It seems like with my blog recently it is either feast or famine! 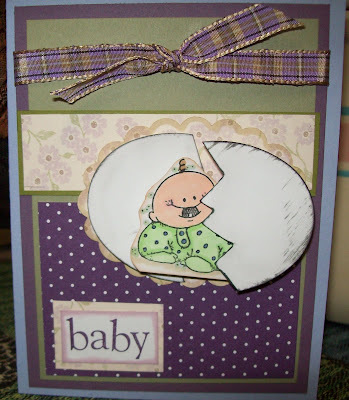 Jen Del Muro's Sketch For You To Try this week inspired me to go to work and come up with this little baby card. The little one is busting out of an "egg" which is an oval punch cut in half with ziggy zag cuts to look like a little egg. I colored the little one (from Whipper Snapper) with my Copics and I shaded the egg with a gray Pallette stamp pad. This little card just tickled me and I hope you enjoy it, too! Thank you for coming for a visit and come back again. I just had to get this cute little Ketto stamp by Stampingbella when I last visited my new neighborhood store, Scrapper's Boutique. I had this floral paper that I thought would go with this little gal and accented it with the little white flowers that I used a marker to color and did the centers with a 3-D paint dot. The little gal was colored with Copics and blended with one of the many techniques I learned in a recent Copic class by Jen Del Muro (thanks again, Jen). I also added 3-D paint dots for the hair decorations. Thank you for stopping by and I've got one more post to make at this session. I recently visited my new neighborhood Scrapper's Boutique and found this kitty paper on sale!! It is BoBunny Cat-Atude and sooooooo cute. I had just the perfect stamp image from Stampingbella to go with it!! 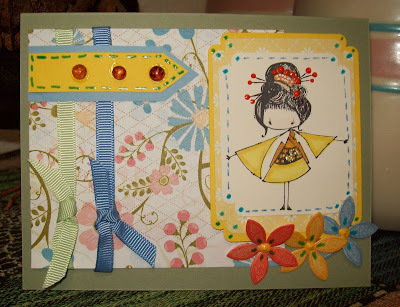 It made a really cute card using complimenting cardstock and ribbon. I also had the cute little paw print brad in my stash. 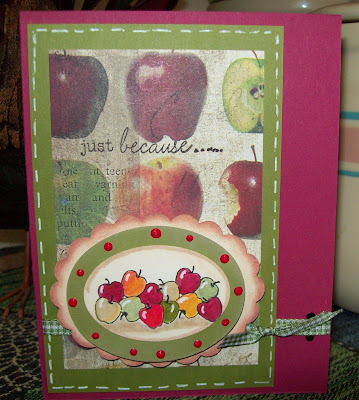 I used my Stampin Up Scallop Edge punch for the card base and repeated it on the border for the image. I cut out two of the little gray kitties from the dp and adhered one direct to the right hand bottom corner and popped the second image up with dimensionals. 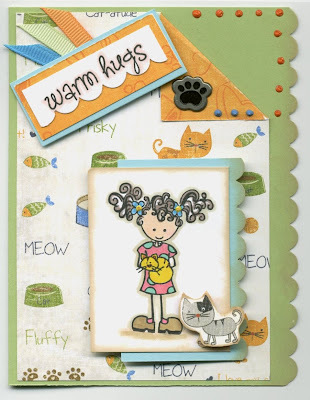 Since I made the card for a close friend, I thought the Warm Hugs sentiment also from Stampingbella was ideal!! I hope you enjoy the card!